The House of Charity Day by Day Program is a comprehensive co-occurring disorder treatment program that firmly believes in meeting clients where they are at, while providing wrap-around support to aid clients in meeting their personal definition of recovery. The Day by Day program uses a harm reduction model to aid clients in building long term supports that promote lasting recovery. The program is designed around evidence based practices and prides itself in being client centered and trauma informed. The program lasts for approximately 120 days, though can go longer depending on a client’s recovery needs. During that time clients, will participate in: group therapy, individual counseling and have access to clinical case management services. For more information please contact our intake coordinator at 612-594-2031. 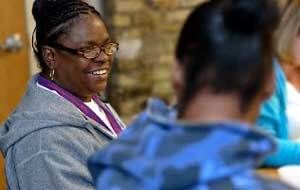 House of Charity serves single adults in the Twin Cities, many of whom struggle with chemical dependency, mental illness, and homelessness. The 2015 Wilder Research study reported that 57% of Minnesota’s homeless adults have a serious mental illness, 51% have chronic, physical health conditions, 30% show evidence of traumatic brain injury, 21% have been diagnosed with drug/alcohol abuse disorder, and 80% have one or more of the above. Of Hennepin County’s population of homeless adults, those who have experienced long-term homelessness: 55% have a serious mental illness, 18% have a substance abuse problem, and 16% have a dual mental illness and chemical dependency diagnosis. Having both is a significant barrier to housing. Our programs offer both. Clients can utilize both housing and our Day by Day assistance. Lodging is available for Day by Day clients after graduation from our program. 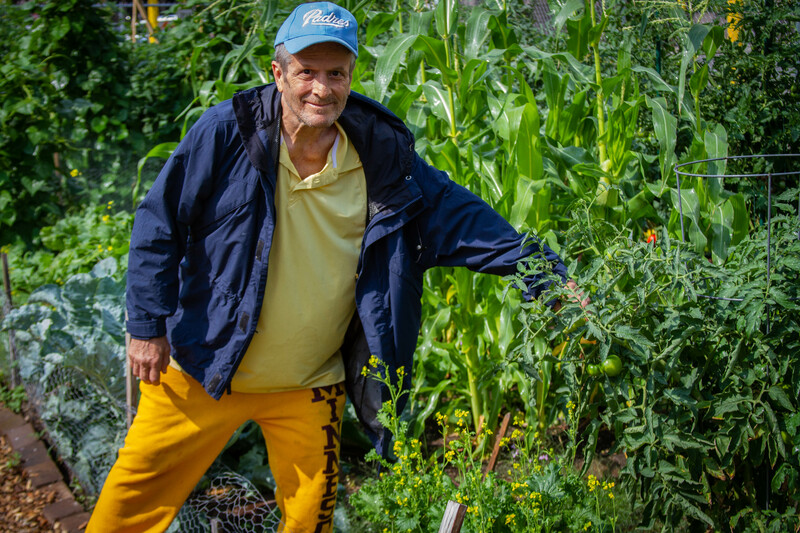 Day by Day client enjoying time spent in our plot at Gethsemane Community Garden. Depression & Anxiety, PTSD, Borderline Personality Disorder, Bipolar Disorder, Schizophrenia, and Grief & Loss. 124 clients were served in 2017. Walk-In Rule 25s or Chemical Health Assessments are available for non-client. For more information and/or to make a referral, contact Kyle, our treatment intake specialist at 612-594-2031. Please fax Rule 25 Assessments to 612-594-2030.